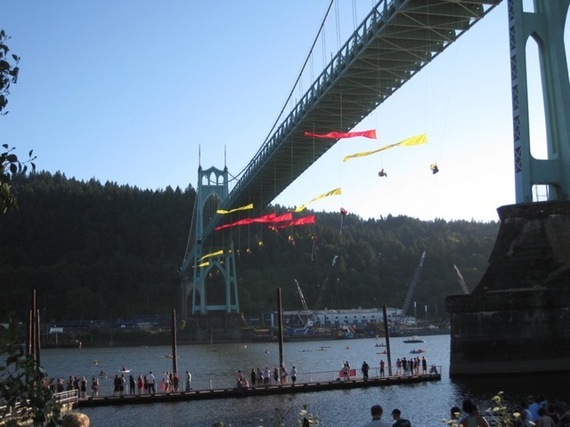 On July 30, the whole world watched as 13 Greenpeace activists dangled from ropes tied to the St. John's bridge in Portland, Ore., red and yellow streamers catching the wind. They were blocking the exit of the Fennica, Shell's ice breaker headed to the Arctic to facilitate drilling. These young activists hung there for 40 hours in makeshift platforms and slings during some of the hottest days on record, before the police and Coast Guard brought them down. One hundred feet below them, filling the river with their colorful small boats, were Portland's "kayactivists" from the local Climate Action Coalition -- some were experienced paddlers, others kayaking for the very first time. On shore stood over 500 people, cheering and chanting "Stop that boat!" Some were moved to tears by this unprecedented spectacle and by the courage of the protesters. But everyone was not so thrilled. The Oregonian printed several letters from readers castigating the activists for disrupting traffic on land and sea and for wasting tax money. One wrote: "Make them pay serious fines or spend time in Portland jail." Another complained: "Congratulations, Portland! You've confirmed that this is a city where it's important to be weird." There arises a legitimate question: what is the difference in civil disobedience and simply breaking the law? Was this an instance in which such a protest was justified? Perhaps it would be useful to look at the history and purpose of this radical form of protest. The principles of civil disobedience are derived from both Western and Eastern sources. Socrates taught that there is a rational ethic that transcends the law of the state. Buddhists adhere to the concept of the dharma, or obedience to cosmic law. John Locke (1632-1704) posited that government takes its authority from the people, and the purpose of law is to secure natural rights. The people are duty bound to change any system of government which fails to align with their natural rights. Henry David Thoreau (1817-1862) wrote "On the Relation of the Individual to the State," (1848) in which he claimed that the authority of the state depends upon the consent of the governed, and furthermore that adherence to justice transcends adherence to law. Citizens have the duty to disobey bad laws, though they must accept the consequences, he said. Gandhi (1869-1948) became the leader of the nationalist movement in India, making civil disobedience, or what he called "satyagraha" -- loosely translated as "insistence on truth" -- as the moral grounding of his work. He was committed to non-violence, and taught that people are bound by duty to resist all untruthful laws. Civil disobedience has been widely used to challenge injustice in the United States, most visibly in the second half of the 20th century, with the Vietnam War and the Civil Rights movement. Martin Luther King, Jr. was deeply influenced by Gandhi in his use of non-violent protest. Like Gandhi, King believed that citizens have a duty to engage in direct, non-violent action in order to challenge unjust laws. His "Letter from Birmingham Jail" was the primary articulation of that approach. In response to criticism from other clergy, King wrote: "Nonviolent direct action seeks to create such a crisis and foster such a tension that a community which has constantly refused to negotiate is forced to confront the issue. It seeks so to dramatize the issue that it can no longer be ignored." Most recently we saw the widespread use of civil disobedience by the Occupy movement as activists challenged current practices of capitalism. By illegally occupying buildings and green space and refusing to move, these protesters brought economic inequity into the national conversation, where questions about justice have burgeoned and developed, leading to our current civic discourse about minimum wage and living wage. Civil disobedience is typically practiced when injustice is widespread and intransigent, and when the laws and lawmakers are not responding to the moral sensibility of the people. It is not only a legitimate form of protest, but sometimes it is the only remaining source of protest. Those who practice it risk arrest, fines, imprisonment, and sometimes violence from the police. So is the practice of civil disobedience justified, in regard to climate change? Unlike war and racism, the effects of global warming are neither clear nor immediate -- though in fact the danger is quickly becoming clearer, as California dries up and wild fires run through the West. It's difficult for people to become concerned about abstractions, about statistics, and future consequences are hard to accurately predict. We are hard-wired to pay attention to our own experience and hard-wired to pay attention to the present and not the future. But pay attention, we must. Climate scientist James Hansen, formerly of NASA, now a climate activist, says our current thinking that holding the temperature to a rise of 2 degrees Celcius will prevent widespread devastation is not correct, that we must hold it to somewhere between 1-1.5 degrees in order to prevent sea levels from rising to the point that coastal cities would be inundated. And we must act immediately, else global warming would be "locked in" and irreversible. The good news is that it is possible to address climate change through a carbon tax, an approach almost universally agreed upon by both conservative and liberal economists. Those using carbon would have to pay for it, thus creating an incentive for sustainable energy sources. The bad news is that many doubt that the political will is there (see William Nordhaus, The Climate Casino, and Dale Jamieson, Reason in a Dark Time). Such a tax would require an unprecedented level of co-operation from all the countries of the world, except the most impoverished. Thankfully, President Obama is trying at last to provide national and international leadership. In a recent speech introducing new EPA regulations, he said: "We're the first generation to feel the impact of climate change, and we're the last generation that can do something about it. We only get one planet. There's no Plan B." I talked with one of the Greenpeace activists who suspended himself from the St. John's bridge, after the fact. He was in his 20s I guessed, with platinum blond hair, green eyes, and a smile that won't wait. He said he got a call asking him to travel immediately to Portland to help block the Fennica. He lives in New York. He didn't think twice, he said -- he got on a plane and came to Portland. I asked him why he would be willing to travel clear across the country and sit in a sling 100 feet above the river for 40 hours in unbearable heat. He just looked at me as I though I had asked a very silly question. "We have to do something," he said. Where did all these bridge sitters and kayakers come from? What is the source of their passion? Apparently it wasn't religion. Nowhere in evidence were the mainline Protestant churches or Catholic churches. Why are religious folk so often missing when bold action is called for? Are we too respectful of the powers that be? Are we too comfortable? Are we so involved with the individual and sins of the flesh that we neglect the systemic sins that bring suffering to so many in our world and that now threaten to make our planet unlivable? There is no greater moral issue before us today than global warming. Our generation has a sacred call to prevent the worst: flooding of our cities, refugees fleeing rising water, failed states, and armed conflict over resources. The people who will suffer the most and the soonest, of course, are the poor. I see again those young people suspended from slender ropes high above the river in the searing heat, see again the huge ship Fennica bearing down on the paddlers in their tiny kayaks. These activists are the David to the Goliath of the fossil fuel industry. They are spiritual warriors of the highest degree, showing us the meaning of sacrificial love, the love that Jesus himself embodied. It's time to rattle some cages. It's time for all people -- including and most particularly people of faith -- to come forward and be counted. The future of the earth is in our hands.